P&O Cruises offer more departures from Southampton than any other cruise line, sailing to over 250 destinations worldwide. The new P&O Cruises Winter 2020/2021 Cruise Collection takes everything you know and love about the UK’s favourite cruise line and takes it up a notch. From sophisticated sailings in the middle east to seeking out the Northern Lights over Norway and bathing in balmy Caribbean waters, the possibilities are endless. With 100s of cruises to tempt you during P&O Cruises Winter Cruise Collection, many of which sail direct from Southampton, now is the time to call and pre-register for your preferred cabin or suite and take advantage of a series of amazing early booking benefits. Book an applicable Select Price P&O Cruises holiday with a 5% low deposit available until 29 April 2019 and choose your FREE Select Price benefit. Choose from FREE on-board spending money, car parking in Southampton or return coach transfers to Southampton. New to P&O Cruises? Then you’ll receive a 5% saving on your P&O Cruises holiday in the Winter 2021 collection, while existing guests can save a fantastic 10% when booking before 29 April 2019. 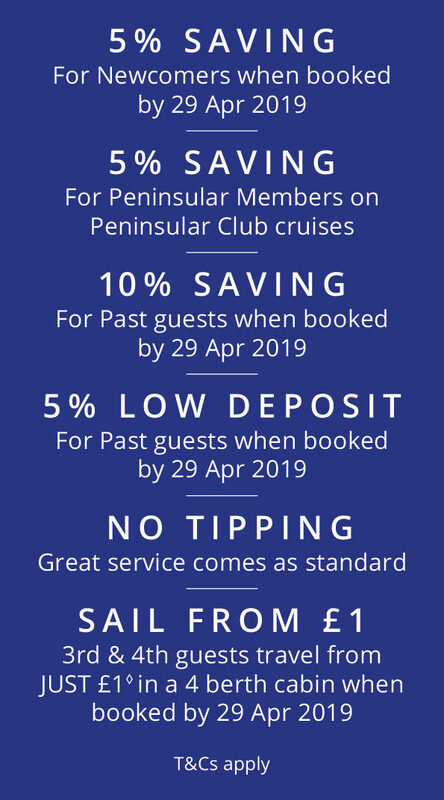 While members of the Peninsular Club will receive an additional discount of 5% on Peninsular Club cruises. Book today with Bolsover Cruise Club by calling 01246 819 819.